Everyone should experience camping and exploring the wilds. There is nothing quite like the tranquility of mother nature. Getting out into the wilderness and enjoying oneself is truly special. There is something special about connecting to the environment and the peace that it brings. When you are in the great outdoors, it’s important to consider the implications of your actions. Here, we will talk about responsible camping, things you should and shouldn’t do, as well as some general tips for camping respectfully. One of the most important things to be mindful of is your waste. Where you put it, what it is and how you manage it are all important. If you are at a camp ground, be sure to ask about waste receptacles. There may be facilities for wastewater or grey water, recyclables and just plain old trash. Leave no trace behind is the rule of thumb for camping responsibly. Generally speaking, if you packed it out, pack it in. Make sure any trash or garbage you have is accounted for. Even trash that is biodegradable can have an impact. It can attract wild animals and they could get ill from rotting food waste. Planning ahead before you set out can go a long way. 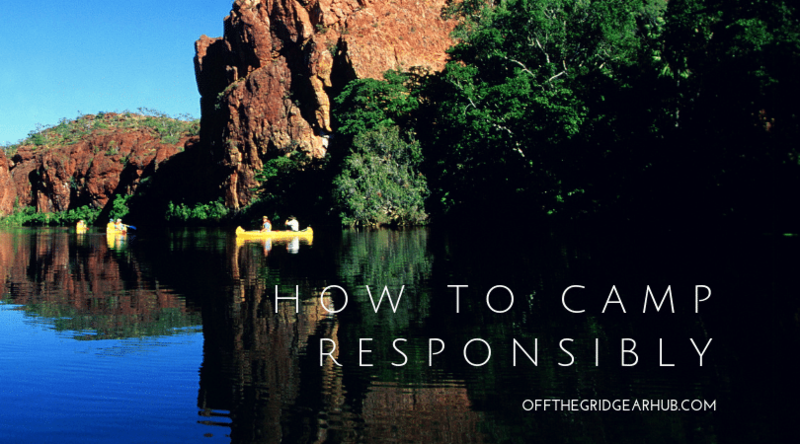 Camping responsibly is something all campers should strive for. Check weather reports and if possible, call ahead to your campsite. Make sure to bring backup clothing and a first aid kit. People in general greatly affect their environment and ecosystems, and it’s very important to minimize your impact as much as possible. Often times, the most beautiful areas are the most fragile. If you are hiking on a trail, be sure to stay in the center as best you can to prevent widening it. If there are marshlands and grasslands, try to minimize flattening flora with your feet. Campfires are an important part of camping out and enjoying the wilderness. Check for a fire pit or a rock ring first. These are often the best places to make a campfire. It may seem inconsequential, but an upturned rock could be the home of small animals. If you do decide to make a campfire, be sure to bring in your own firewood if possible. Harvesting and cutting down trees can have a dramatic effect on a local ecosystem. If you are at a registered campground, be sure to check the rules. It may be prohibited to cut down trees for firewood. If you must collect fuel for a fire, don’t cut down any living tree. Look for dry dead wood instead, as it burns better than a freshly cut living tree. This can help minimize your impact and goes a long way in camping responsibly. When nature calls, it’s important to put your waste in an appropriate place. Count out at least seventy paces from your site, away from water sources such as creeks, rivers and lakes. If you’re defecating or doing the number two, be sure to bring a small shovel with you to dig a hole. If you don’t have a small shovel or scoop handy, the heal of a hiking boot works well to. Bury your waste to speed up the decomposing process. It’s important to do this, as it helps the waste process faster into the environment. Curious animals could also stumble upon the waste and consume it, causing them to get sick. Popular tourist camping spots, such as natural parks have their own set of rules. Be sure to follow them. They are not there to take away your enjoyment, but to preserve the wilderness for generations to come. Some beautiful nature spots in North America are already permanently damaged from a surge of visitors. This is an alarming trend. So do your part to camp responsibly.